Craig Stirling, Sharron Macready and Richard Barrett are The Champions. Endowed with the qualities and skills of superhumans - qualities and skills, both physical and mental, to the peak of human performance. Gifts given to them by an unknown race of people from a lost city in Tibet. Gifts that are a secret to be closely guarded - a secret that enables them to use their powers to their best advantage... as The Champions of Law, Order and Justice. Operators of the International Agency, Nemesis! Suspense and action are the keynotes of this stylish series in which danger is mixed with a dash of wry humour and a lot of charm. Set against the same global espionage backdrop as the top-rated ALIAS and MISSION: IMPOSSIBLE, THE CHAMPIONS stars Stuart Damon, Alexandra Bastedo and William Gaunt as the three agents of Nemesis. 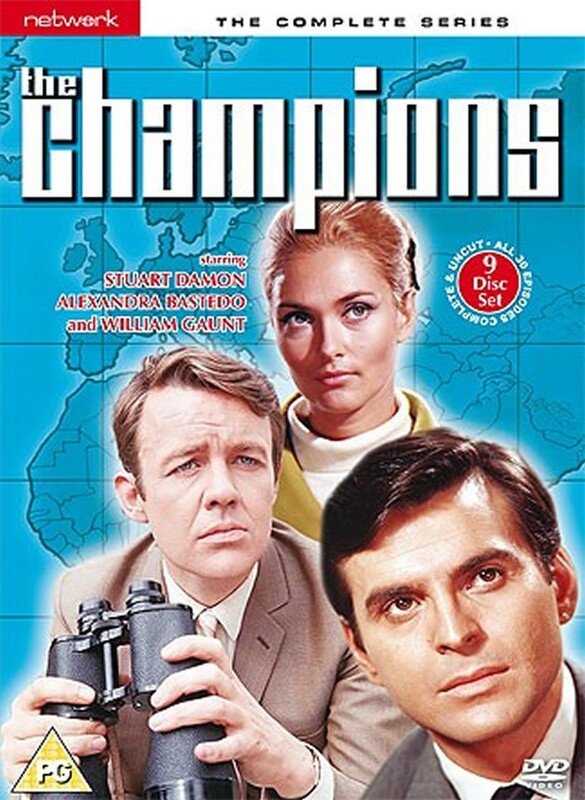 All three stars have been reunited exclusively to contribute interviews and commentaries for this Network DVD set – the first time they have come together since they made THE CHAMPIONS in the late 1960s. * Episodic Trailer gallery - a gallery of the nineteen remaining Champions trailers (with UK and US soundtracks), specially transferred from the original film elements for use in this set. * Generic trailer gallery - a gallery of various generic trailers of differing lengths which have been transferred from the original film elements for use in this set. * Merchandise Image Gallery of Champions memorabilia showcasing images of the merchandise produced for The Champions during the sixties and early seventies. It includes the full fronts and backs of all the Champions trading cards. * Variant Titles featuring unused title music composed by Robert Farnon.